What is Sorafenat (Sorafenib Tosylate) used for? 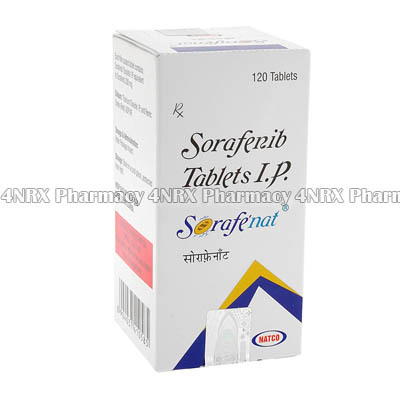 Sorafenib (Sorafenat) is a kinase inhibitor used by patients suffering from hepatocellular carcinoma (a type of liver cancer), advanced renal cell carcinoma (a type of kidney cancer) and some cases of thyroid cancer. Sorafenib works by blocking abnormal proteins that cause cancer cell reproduction. How should I use Sorafenat (Sorafenib Tosylate)? Sorafenat is usually prescribed at a dosage 200mg twice daily. Your doctor prescribe a different dosage depending on the severity of the cancer and your medical history. Swallow a tablet whole - do not crush or chew the tablet. Take the tablet with a glass of water. Take the tablet on an empty stomach. Your doctor will tell you how long to take sorefenib. Do not stop taking it early if you begin to feel better. What are the side effects of Sorafenat (Sorafenib Tosylate)? The following side effects are common when taking Sorafenat and can be mild and temporary. Tell your doctor if they persist. If you have any allergies tell your doctor before taking Sorefenib - especially if you are allergic to any medicines. Tell you doctor about any prescription or over-the-counter medicines you are currently taking. Sorefenib may not be a suitable treatment if you have high blood pressure, bleeding problems, chest pain, heart problems, kidney problems other than kidney cancer, or liver disease. Check with your doctor if you suffer from any of these. Tell your doctor if you are pregnant or planning to become pregnant - Sorefenib can decrease fertility. Sorafenat may not be suitable if you are breast-feeding or planning to breast-feed.